A bold collection of 100 recipes puts a vegan twist on comfort food in Lauren Toyota's latest book �Hot For Food Vegan Comfort Classics: 101 Recipes to Feed Your Face� (Ten Speed Press, $22.00/softcover). 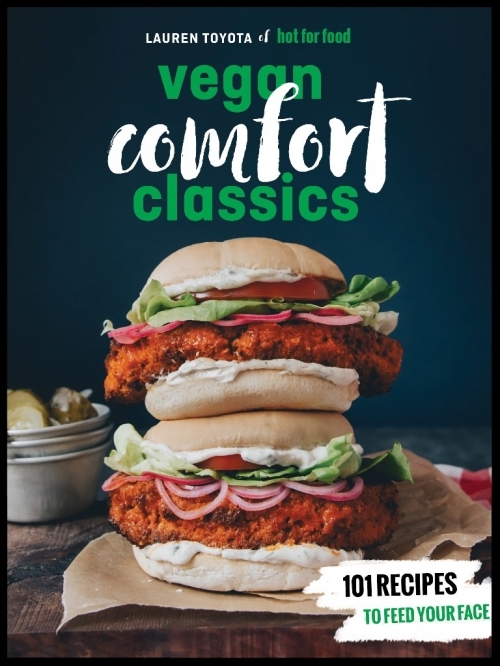 This is a fun and irreverent take on vegan comfort food that�s saucy, sweet, sassy, and most definitely deep-fried. Feed your face with plates piled high with the likes of fried chicken, mac 'n' cheese, and cheese steaks � each made with simple indulgent vegan ingredients. Not one to hold back, Lauren Toyota loads on the cheese sauce, ranch, bacon, and barbecue sauce, all while sharing personal stories and tips in her engaging and hilarious tone. The result is craveworthy food as Lauren shows readers just how compelling vegan food can be with recipes like Southern Fried Cauliflower, Oyster Mushroom PoBoy, and Raspberry Funfetti Pop Tarts � made for sharing with friends at weeknight dinners, weekend brunches, and beyond. �Hot For Food Vegan Comfort Classics� offers separate chapters on Finger foods, veggie sides & big salads, hearty soups, stacked sandwiches, oodles of noodles, main courses, and desserts (which includes such tantalizing choices as Apple Fritters, Tiramisu Trifle, Fudgy Brownies, Oatmeal Chocolate Chunk Cookies, etc. Even for those who are not vegans, this book offers such a lavish variety of recipe choices that it becomes tempting to become one. Lauren Toyota is a former MTV Canada host and a YouTube sensation. Her channel and blog, hot for food, attract a wide and engage audience of young people curious about how to make vegan food fast and fun. In less than three years, her YouTube channel has gained over 391,000 subscribers. She lives in Toronto, Canada.